After Rikyu's enforced suicide, Shoan was looked after by Gamo Ujisato of Aizu. Soon he was allowed back to Kyoto and on ground in front of Honpo-ji temple he restored the Sen family residence. The land was 41 ken (one ken is about 180 cm) from north to south and 16 ken from east to west, although the southernmost edge of the land was 14 ken. We do not know what kind of building there was at that time, but on February 25 of Keicho 13 (1608) Matsuya Hisashige, a lacquer craftsman from Nara, visited the Sen family residence and drew plans of two of the tea rooms. On this day, Matsuya was invited first to Sotan's tea gathering. This tea room was a hirasanjo (with three mats in a line, looking sideways from the entrance), mukogiri (hearth cut from the corner where the host's mat meets the guest's mat), with a pillar between the guest's mat and the host's mat. It had a shikiri kabe (partitioning wall) with an arched opening (kato-guchi). The host carried in the utensils and set them down, then sat down and opened the katoguchi fusuma (sliding door). So the guests could not see him bringing in the utensils. It was said that this was Doan's idea because he had trouble with his leg, and so this kind of structure is called Doan-gakoi (Doan enclosure), but this is not certain. The Doan-gakoi has daimegiri (the hearth cut into the daime three-quarter size mat). The mukogiri tea room is also called Sotei-gakoi. Next Matsuya was invited to a tea gathering by Shoan. 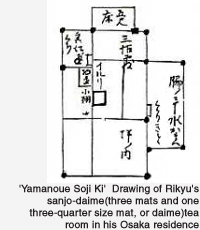 This time the tea room was a fukasanjo-daime (three mats in a line extending inwards from the entrance, plus a daime three-quarter size mat). The toko (alcove) was 5 shaku (about 150 cm) wide, the tokobashira (alcove post) was square and the tokogamachi (alcove rail) was shinnuri (formal black lacquer). Between the host's mat and the guest's mat there was a nakabashira (middle post) in the daimegamae style, but the partitioning wall went from ceiling to floor. So the guests could not see the utensils on the host's mat. This kind of tea room was actually first built by Rikyu in his Osaka residence and this was a reconstruction of that. It is the origin of the daimegamae. Kamiya Sotan of Hakata, who was invited to the tea room in the Osaka residence, calls the temaeza (host's mat) 'tsuginoma' ('next room') in his tea record. Probably it seemed to Sotan that Rikyu was doing tea procedure in the next room. And in fact the tea room used by the previously mentioned Sotan was also one in which the host's mat was separated from the rest of the room, as though it were a tsuginoma. So in the Sen family at that time there were two such tea rooms. Also, when tea had finished, Matsuya was shown into the shoin room. This was the room that Shoan had built with a design based on the coloured shoin room in the Juraku residence, namely the Zangetsutei tea room.